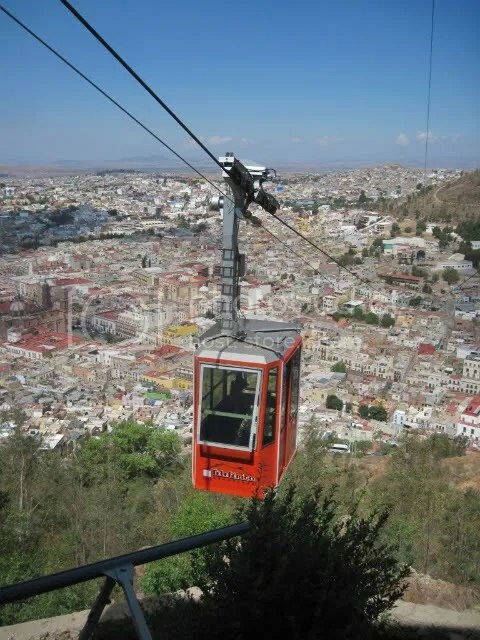 Posted on August 22, 2011, in Himmelsk, Mexico, my digital photos, my senryu, REDnesday, rooftops, Ruby Tuesday, senryu, Sky Watch Friday, Straight Out of the Camera Sunday, teleférico, Zacatecas. Bookmark the permalink. 27 Comments. OOOO! Quite an adventure to travel on that wire! What a view! OMG now this makes me shout for joy ^_^ Love rides and the landscape above is terrific!! Love it! Very good and nice photo. I wish I was in there! This looks so scary to me! This is quite a view from this Mexican alp, the dwellings below almost imperceptible. My only question is you are going up – or down? Perceptions matter! Awesome picture! Talk about a bird’s eye view! I like how the red of the car helps pick up all those red rooftops below. What a perfect haiku for this red cable car! I would never have guessed this was in Mexico. Great city shot! Since the linky is not up, here is my Ruby Tuesday. I tried riding one of these long ago, . I was pleading for them to let me down. High places or not for me. This is a neat one in red. What a great scenic ride that would be. Beautiful city!!!! I’ve ridden on one in Germany-so exciting. Nice picture, but I don’t like to use these things if it’s not absolutely necessary, lol ! What a beautiful view!! Wow a great cable car too! This is a dizzying view! It’s a beautiful view indeed! I hope I can ride in a cable car one day, poor me. It would be awesome then! Thanks for sharing that colorful cable car! Thanks for visiting my Ruby Tuesday: Rambutan: http://www.cacai-m-place.net/2011/08/ruby-tuesday-rambutan-fruit.html . Sorry late visit. Have a great weekend! What a wiew! I cuoldn’t have taken that photo. I don’t do heights.. The view is magnificient but I think I would be afraid to ride in it!